STERLING HEIGHTS, Mich. - Sterling Insurance Group – a Top 200 Insurance Firm out of 37,000 nationwide – has published their summer edition of their bi-annually published Risk & Business magazine. The magazine features articles written by each of the agency’s commercial insurance and employee benefit producers, as well as the firm’s two principals. Advertisers in this issue include Warner Norcross & Judd and Forgotten Harvest. 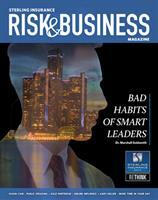 Sterling Insurance Group hopes you enjoy their latest Risk & Business Magazine.